We will conclude the conference with a panel discussion formed of local, successful business women. Women that have pushed the limits themselves, and broke through the glass ceiling. Susan Ramirez is the founder and CEO of Austin Angels, which she started back in 2010 with the hope of improving the lives of every child in the foster care system. While working long hours in corporate America, Susan felt a higher calling to lead her community in service and thus made a change in career. As a former foster parent, Susan knows the hardship of caring for children in the foster care system and understands the need for community support. Susan has been recognized by local TV network KVUE and also received a community award for the Top Five Who Care. Additionally, Susan received the Woman Philanthropist of the Year by Texas Women in Business and was recognized as Leader of the Year by Texas State University. Susan is wholly dedicated to improving the life of every child in the foster care system and has successfully moved an entire community to passionately care about these children and the challenges they face. Susan has been a featured speaker at countless conferences and community events, as well as podcasts like DAIS by Rachel Hollis and Defining Audacity by Drew Myers. She also served as the keynote speaker at Austin Angels’ first annual fundraiser, Dare To Dream, which gathered hundreds of philanthropic leaders from the Central Texas area. Susan and her husband, Chris, have been together for 10 years and have two boys: Ryder (4) and Reid (10 months). Susan has hopes of a daughter in the future and believes she will come from adoption through the foster care system. Katie Fang is the founder & CEO of SchooLinks; a college readiness platform that helps students plan their post-secondary paths and districts improve their college and career readiness program outcome. Katie is a world traveler and studied abroad in four countries since the age of twelve. After her world adventures and founding SchooLinks in Los Angeles, she settled in Austin, TX to continue scaling SchooLinks. She was named Forbes Top 30 under 30 in 2018, Top Texan under 30 in 2016, the Young Woman to Watch, was on the cover of Austin Woman June 2016 issue, and was the Woman's Way award winner in May 2017. 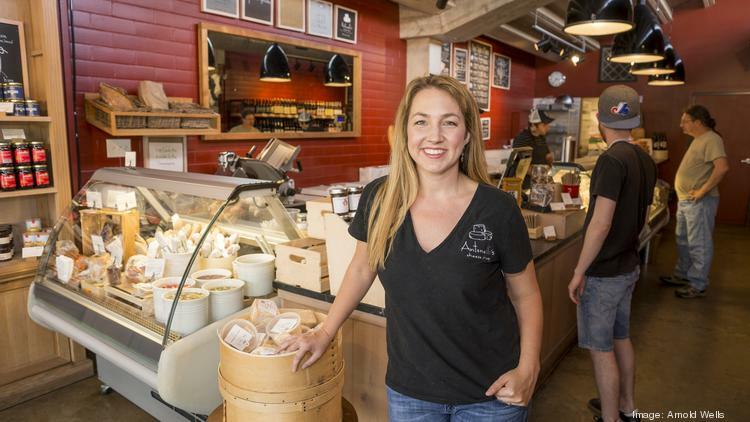 Kendall Antonelli founded Antonelli’s Cheese in Austin, Texas alongside her husband John in 2010 after a honeymoon decision to quit their jobs in search of a passion with purpose – working together to support artisanal producers and tell the story of handcrafted foods. Driven by the mission to "Do Good. Eat Good. ", their small mom and pop shop has been voted Austin Chronicle "Best Artisan Food Company" and Edible Austin "Local Heroes,” as well as named one of the best cheese shops in America by Travel + Leisure Magazine and The Gourmet Retailer. Today the business operates two cut-to-order cheese and charcuterie shops as well as a bistro; an events program hosting 200+ tastings yearly; online web sales and shipping of gift baskets and a monthly cheese club; and a wholesale program supplying 175+ Texas chefs. In 2016, Kendall was featured by the Austin Business Journal as one of the top entrepreneurs to know in Austin; she also received a Blazing Star Award from the Women's Chamber of Commerce of Texas. Kendall regularly speaks and presents on topics of entrepreneurship and living a life of passion with purpose. Kendall serves on the board of the Austin Child Guidance Center, is on the steering committee of the Good Food Retailers Collaborative, and is honored to be a selected member of the Guilde Internationale des Fromagers and Les Dames d'Escoffier. She also spends time as an active member of Impact Austin, as well as on advisory boards for The Refinery Collective and the Austin Food Bloggers Alliance. Kendall has a Masters degree and nonprofit management certificate from The University of Texas and received her undergraduate degree from Georgetown University. Kendall’s culinary journey and adventure are made sweeter with her husband John, toddlers Everett and Elia, and two adopted yellow lab mixes Lucky Day and Luna Loca. the Wells Fargo Government and Community Relations Group. Lending group at Chase Bank and as a loan officer for Peoplefund. She has over 20 years of experience in the financial services industry. Administration in Finance from the University of Texas in Austin. Using a mix of frank talk and good humor, Cynthia is known for delivering the hardest of news in the nicest of ways. She’s been the biggest fan in the corners of organizations such as Dell, Dun & Bradstreet, The Methodist Hospital, Digital Realty, Milk and Honey Spas, Cintra US, Enspire Learning, Abilitie, Planar Systems, Lutheran Social Services (now Upbring), and has helped over 800 executives achieve a winning balance of power and likeability as a leadership coach. Since then, Cynthia has used research in persuasion and compliance-gaining to help over 800 (and counting!) executives become top-notch leaders. In addition, she combines her work in theater and business to help people polish both their interpersonal and public speaking skills. Cynthia holds a Master’s degree in Interpersonal Communication from U.T. where she researched sales anxiety and persuasion. She has also taught communication at St. Edward’s and LeTourneau Universities. On weekends, she performs with award-winning Girls Girls Girls Improvised Broadway Musicals in Austin, Texas. That’s improv, y’all.